Here are the highlights of Guild Hall’s 82nd summer season. Guild Hall’s 82nd season began last Saturday, June 15, with the opening of the “Artists & Writers: They Played In The Game” exhibition. The newest show, commemorating the 65th anniversary of East Hampton’s annual Artists & Writers softball game, showcases the work of local artists past and present who have been participants. 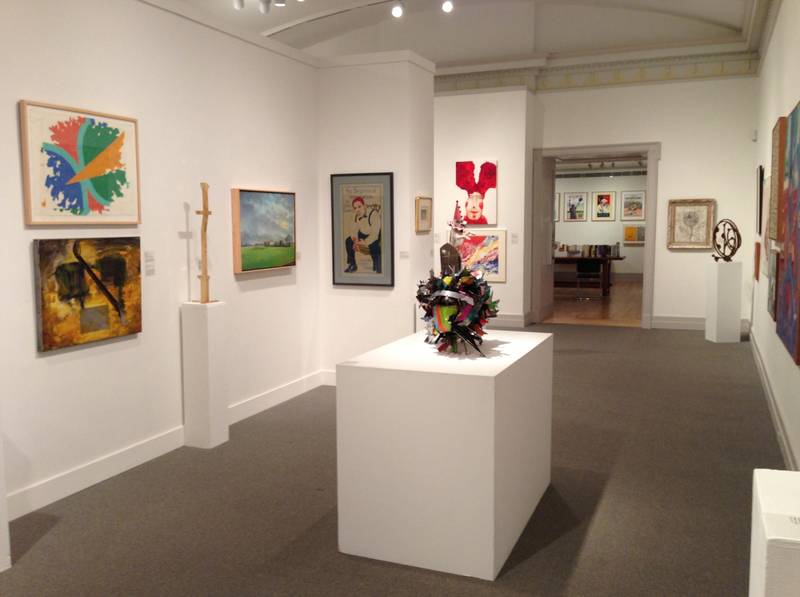 Among the artists represented are Jim Dine, Jackson Pollock, Willem de Kooning and Jimmy Ernst. An exhibit of Amagansett based artist John Alexander’s paintings also opened on June 15. The colorful, semi-surrealist work demonstrates both a fascination with the natural world — birds in particular — and a satirical sense of humor that pokes fun at the themes of culture. The largest work in the exhibit, which faces the visitor as he enters the gallery, is “Lost Souls”, a cartoonish pastiche that is part Washington Crossing the Delaware, part Raft of the Medusa, with monkeys, beaked carnival masks, and a healthy roasting of organized religion. Alexander, who has also played in the Artists & Writers Softball Game, is represented in both shows. After both the current exhibits are taken down on July 28, they will be replaced by a show of new works by famed-photorealistic painter Chuck Close, opening to the public on August 10. Many of the new portraits will feature faces from the local art scene such as Cindy Sherman and Paul Simon. The exhibit will feature Close’s recent experiments into new mediums, such as tapestry. Close himself will appear with art historian Robert Storr to discuss his work from 3 to 4 p.m. opening day. This segment of Guild Hall’s “Artists in Conversation” series will be free and open to the public. On Aug. 9, the night before the Close exhibit begins, ticket holders to the annual Guild Hall summer gala will be allowed to view the new show early. The gala itself will be held at the Bridgehampton home of Barnes and Nobel CEO and Dia Beacon art museum patron Leonard Riggio. Apart from food and dancing, the gala will also include a tour of Riggio’s private art collection. On June 29, the Upright Citizens Brigade— an improv comedy troupe whose members have performed on MadTV, The Daily Show With Jon Stewart and Late Night with Conan O’Brien — will appear. On July 5, the first installment of the three part “SummerDocs” series, hosted by Alec Baldwin will begin at 8 p.m. Baldwin will bring new documentaries on a variety of subjects to the public’s attention and lead a Q&A with the filmmakers. On July 6, Broadway’s Audra McDonald, star of the recent revival of Gershwin’s Porgy and Bess, will be performing as part of the Season Spectacular, to be held at a private residence at 7 p.m.
Additionally, on Aug. 18, the key dancers from the New York City Ballet will perform on Guild Hall’s stage at 8 p.m. In terms of music, Guild Hall is pleased to announce a return to classical for the first time in several seasons, with the St. Luke’s Chamber Ensemble, performing on Aug. 11. Jazz musician Wynton Marsalis and his band, noted for their performances with Jazz at Lincoln Center, will take to the stage on Aug. 24. For blues fans, the Taj Mahal Trio will perform onAugust 30, and on Sept. 1, the so-called “Godmother of Punk”, Patti Smith will give a concert at 8 p.m.
With regards to special events, Guild Hall Contemporaries — aiming for a younger crowd between 21 and 45 — will host its first annual summer party, on July 20 from 4 to 6 p.m., featuring video art performances, demonstrations from chefs and mixologists and a Porsche you can drive. Though its events might seem high-flying, Appelhof stresses the importance of Guild Hall’s relationship to the community. Asked about the process that went into creating this season’s line up, she said, “People really stepped up and said, ‘How can we help you bring great performances to East Hampton?’” Several of the performers will be working for free, and other highlights of the summer season have been heavily subsidized by the generosity of members.